A Resolution X in GTA Chinatown Wars. The Resolution X is a sports car featured in Grand Theft Auto: Chinatown Wars. The Resolution X is categorized as a heavily modified tuner based on a two-door coupe longer than even the Style SR and MK GT9; the car is further distinguished by a red-and-white body color, a red-and-black hood lid, as well as purple neon underglows that light up at night. The name is suggestively based on that of the Mitsubishi Lancer Evolution X, although the car is dissimilar to the Mitsubishi in design, with the exception its red and white colors (commonly associated with the Mitsubishi Lancer's rally racing colors). The Resolution X is a considerably good in performance, possessing excellent acceleration and top speed, while featuring good cornering (without the aid of brakes or a lack of engine power) and very responsive brakes. However, the car's durability is low. The Resolution X is one of the three cars Huang Lee must steal in the mission The Wheelman. 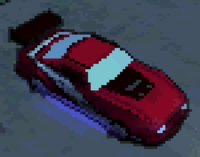 Players can attain the car, which is depicted smaller than a regular Resolution X, by storing it in one of their safehouses. This car is unlocked for purchase when the player completes the mission "Pimp His Ride", and then becomes available at the BOABO Auto Merchant. Parked in a driveway of a house in Beachgate, near a Turismo. This page was last modified on 4 August 2012, at 02:27.